Hey y’all! I’ve been MIA for a little while… it has been a wild past couple weeks. My younger brother was bitten by a copperhead a week and a half ago and it seems like life has been going non-stop since then! Thankfully he is okay and appears to be recovering just fine, but it was quite the scare. I am also preparing to do a booth at a local fall festival with my soap and bath and body products next month. I’m really excited about that but also a little stressed because I have no idea how much inventory to bring! It’ll be a good experience though so I’m looking forward to it. Riding lessons are also picking up now that school has started which is GREAT but requires me to split my brain a bit between crafting and horses, something I’m still learning how to do. When I get the overwhelmed I find the best thing I can do is take a little time to clear my head and jump back in refreshed, rather than just try to push through it. This is hard for me because I feel like I’m just slacking off, but in reality I am so much more productive when I take the time I need. One of my favorite ways to relax and clear my head is soaking in a hot bath. Using essential oils I create different aromatherapy blends that help relax my mind, soothe sore muscles (great for when I have had lots of lessons and have been working outside! ), or even energize me! The thing with using essential oils in the bath is you want to blend the oils with another substance before putting them in hot water because they have a tendency to just vaporize. One of the easiest and most cost effective ways to do this is by creating bath salts. 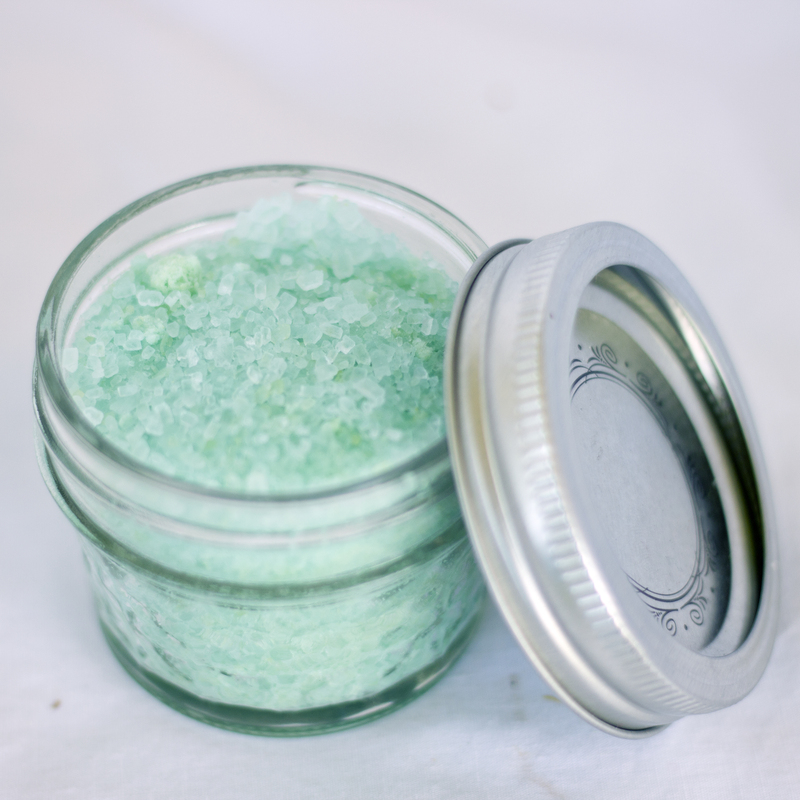 Bath salts are soooo easy and rewarding to make. You can be so creative with them. The salts can aid in detoxifying your body, gently softening and purifying your skin, and soothing achy muscles. Does it get any better than that?! I am going to give you a base recipe I use, but you can add all sorts of different ingredients to create blend that is entirely your own. You can search online for different types of salts that can be added that are more extravagant than sea salt and epsom salt, but these ingredients are a good place to start! You can also add different types of clays for added detoxifying and skin purifying benefits. I usually fill a 4oz jar about 2/3 of the way full with epsom salts and then top off with sea salt and baking soda. I add a teaspoon or so of liquid glycerin, and also some moisturizing oils. I usually use jojoba oil as a moisturizing oil and add about a teaspoon, but you can pick which oil (if any) you would like to add and play with the amounts until you find the right blend for you. The best part is deciding on your essential oils and blending them with the salts. Play with these blends until you find a scent you like. You don’t necessarily have to use all the oils I suggested in each blend, or you can even add others that you think would make the blend even better! Add your essential oils to your moisturizing oil (jojoba, olive, coocnut, etc) and then blend with the salt mixture. I use about half this recipe to soak in a hot bath. You can use more or less depending on your preferences! If you are looking for essential oils to use in this recipe, please click here to purchase 100% pure therapeutic grade essential oils.